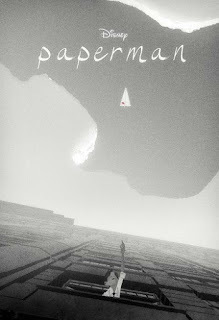 Rounding out my coverage of the new home video release Walt Disney’s Short Films Collection is 2012’s Paperman, a movie about an office worker who lets the girl of his dreams slip away, only to be given a second chance to make her acquaintance. Presented mostly in black-and-white (the girl’s red lipstick is the only color in the film), Paperman is a gorgeously animated romantic comedy, borrowing its style from Disney’s then-recent release, Tangled, which combined computer graphics and hand-drawn animation. In addition, the movie, much like The Little Matchgirl, relies more on music and images than it does dialogue to relate its tale of young love (the score, composed by Christophe Beck, is quite catchy). As for the characters, you can’t help but root for them (the man consistently puts his job at risk for the sake of love, and we hope he’s not doing it all in vain). Winner of the Academy Award for Best Animated Short in 2013, Paperman is a grand mix of style, story, and characters, as well as a reminder of just how wondrous the films produced by the House of Mouse can be. As for Disney’s Short Films Collection, I recommend you buy it immediately; from start to finish, it’s magnificent.